Welcome back and happy Monday kids. You will recognize this image from my home page so I thought I should share it with you so you know the back-story and why I have it posted on my home page slideshow. The infamous catwalks. I was shooting here earlier in the year with Steve Beal (www.stevebeal.com), Brian Matiash (www.brianmatiash.com), Bob Lussier (www.lussierphoto.com), Jesse Pafundi (www.goldenhourstudio.com) and Brian Furbush (www.brianfurbush.com). We had an amazing time together, getting to know one another, building our rapport, over the art of photography that brought us together. I have been learning a lot from all of these guys over the past 6 to 8 months. Not so much on the image taking side, though I do get inspiration from their work, from their collective ‘eye’ when we are out shooting together. Where I really have learnt so much is on the processing side, as anyone who has listened to a Matiash webinar can attest to. That just takes time and repetition and a lot of honest feedback. When we first started to shoot together I worried that we would all have very similar images. I think now that it is more in my mind because when we do shot in the same location, we wind up, invariably, coming up with different looks of the same subject. Also, I sense there is a kind of code, unwritten, that makes these guys, in my mind, really honorable. By that I mean if someone has a shot similar to one posted by another photographer, they don’t post it. Not if it is overly similar. I call that gentlemanly, which is why I really love shooting with these guys. That all said, I have not seen any singular images of the catwalks posted from these guys from our shoots together so I feel even better about posting this image today. And if you do find that you have posted this Beal or Lussier, don’t tell me about it!!!!! Timing, in photography, much as in life, is ‘everything’ as the saying goes. 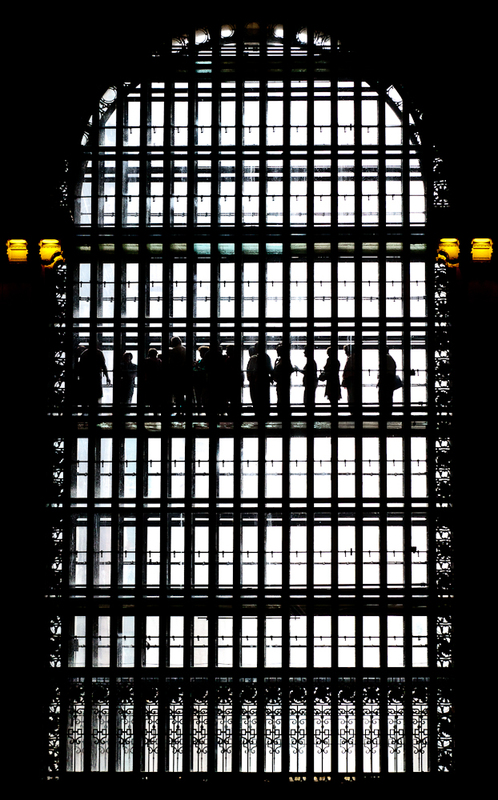 I was looking across the main floor of GCT when I happened to look up and see a group of people high up on the catwalk opposite my vantage point silhoutted very nicely against the light. I was on the east staircase with my 70-200mm as this group stopped to look out the windows on the west side of the terminal. I really liked the feel of the group of folks bunched up on the left side of the image with the stragglers on the right side. Their positions reminded me of the times I am shooting and find that I am always the last one out of a room or space or location firing off the shutter until ultimately being forced to leave. I can very much be that last guy on the right. When I framed this shot, I distinctly had it in mind to process it monochrome to create a ‘throw-back’ look to a kind of ‘mid-century’ time where the outlines of the people portend a ‘Mad Men-esque’ feel. You’ll notice only a hint of color in the lights to the left and right of the arches in the two sets of light. I wonder what these are talking about or listening to. I am sure it is my dear friend Danny Brucker of Grand Central Terminal media relations telling them all about the history of this beautiful structure. RIIIGHT!! Posted on Monday, September 19th, 2011 at 11:01 am. Filed under: Black & White, Grand Central Terminal, New York City Tags: b/w, black and white, catwalk, central, city, GCT, grand, Grand Central Terminal, Manhattan, new, New York City, terminal	RSS 2.0 feed. What a freaking cool shot dude! That definitely looks like Danny! Loved this shot on your homepage and love it here even more with the explanation. Great capture broheme! great shot and framing! the b/w processing really fits the subject here, and the backlight defining the silhouettes is just divine! well done!